It is an honor to have Jacob, aka The Leukemia Slayer, as a very special guest this week at My Two Hats. Jacob was diagnosed with leukemia in 2010 and he and his family have since done incredible work advocating for children with cancer. 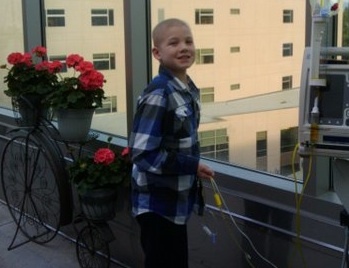 As part of Childhood Cancer Awareness Month, I interviewed Jacob about his experiences. Jacob’s words are insightful, moving, and important. Please read on and then do what you can to get involved and spread awareness. HR: Tell me a little about yourself. J: I am 11 years old, I was born in Pembroke Pines, Florida. My family moved to California when I was 5. My Dad’s name is Todd, my Mom’s name is Sherry and I have a little brother who is 6 and he is in the first grade. HR: What grade are you in? What is your favorite part of school? J: I just started middle school, 6th grade. School is hard for me because I get tired easy. I missed most of 4th grade and a lot of 5th grade because of my treatments. This is my first year back full time since I was diagnosed. My favorite part of school is lunch! My favorite subject is Science. HR: What is your favorite thing to do when you’re not in school? HR: When were you diagnosed with leukemia? J: I was diagnosed on December 2, 2010. I was 9 years old, and was sick for about a month before I was diagnosed. I had really bad headaches, was really tired, my joints hurt, I was getting fevers, and had lots of bruises. I have high risk acute lymphoblastic leukemia. Leukemia has a long treatment, I will be in treatment until March 2014. HR: When did you become The Leukemia Slayer? How did you think of the idea? J: Cancer is like having an enemy in your body and you have to fight hard to beat it. It is hard sometimes when you are feeling really sick because of the chemo and when I came up with the name I was really sick and could hardly eat, I was throwing up a lot and was having a really hard time with my hands and legs being weak from one of my chemos, vincristine. It made my hands feel weird and weak, for awhile I couldn’t even do my legos (which I love to do) and it was really frustrating. My Mom and Dad talked with me about how the medicine has to be really strong to kill the bad cancer cells, and the chemo doesn’t know the good cells from the bad cells so it attacks both but I would get strong again. It is like a big war going on in your body, and I thought it would be fun to have a name that would show people I am fighting a war with leukemia, so I came up with The Leukemia Slayer! I came up with the name about a year and a half ago, and that is how lots of people know me now, I think that is cool. I think it also helps other kids to feel like if I am slaying leukemia they can too. J: It’s really hard. We miss lots of school and can’t do all the fun things we used to because we are either in the hospital or neutropenic or feel too sick. Once in awhile I feel sad and angry because I had to get cancer, and that any kid has to get cancer, but being mad makes me want to help find a cure. Leukemia treatment is really long, my treatment is about 3.5 years long. The first year was the hardest and I was the most sick. 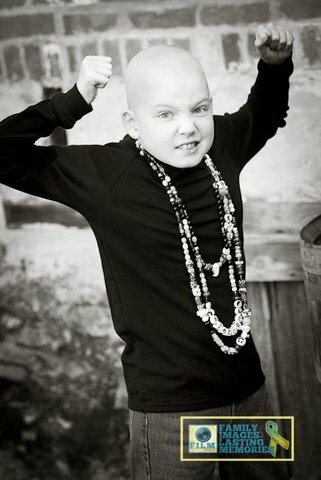 I would like grown ups to know that even if a kid with cancer looks good to you and their hair is growing back it doesn’t mean they feel better or are cured. We have to take a lot of steroids that make us feel crazy and hungry and achy. We get lots of pokes for blood draws and chemo that makes us feel gross. We have lots of pills to take and we don’t have a choice. If a cancer kid tells you something hurts don’t tell them it doesn’t, because you don’t know. Don’t think we are lazy in school if we have a hard time doing our work, our bodies are working extra hard to fight the cancer. Don’t feel sorry for us, we just want to be normal kids. Be nice to our families, it’s hard for them too. We are tough and strong, but sometimes it’s scary. Little things like a card or letter makes us feel good, knowing people care about us and understand what we have to go through feels good too. HR: What do you want to say to other people fighting cancer? J: That I know how it feels, but we have to keep fighting. Try to keep a positive attitude but don’t feel bad when you are having a rough day and feel upset, because we go through a lot and have a right to have some bad days! Always try to spread awareness so other people realize kids get cancer, and we need a cure. Be proud of yourself you are fighting a big war. Also, lots of people love you! HR: I’ve heard you are doing a lot of things to help other kids with cancer and to spread awareness. J: I really want to help find a cure for cancer. Right now I am doing a fundraiser for my hospital Lucile Packard called Hoops 4 Hope. 100% of the money raised goes to childhood cancer research. I am excited for this one since the money goes directly to research at the hospital that I go to. Also, I have had two Alex’s Lemonade Stands and have raised about $6000.00 for childhood cancer research. 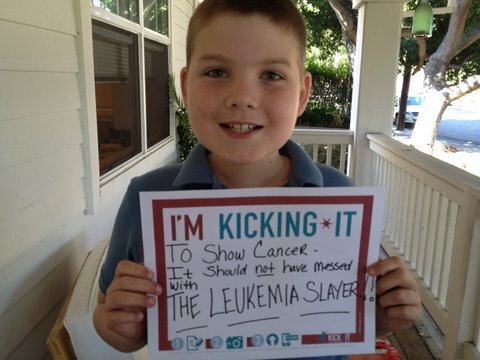 I have a fan/awareness page on Facebook called The Leukemia Slayer. Right now I have over 6000 fans who are awesome! Last year at Christmas time I asked my fans if they would each donate $1.00 to my Santa Slayer project so I could buy and wrap up presents for the kids in the inpatient and outpatient oncology floors. My fans sent in $1700.00! I was able to buy tons of gifts and deliver them, it was really fun and I was glad I was able to make the other kids smile. 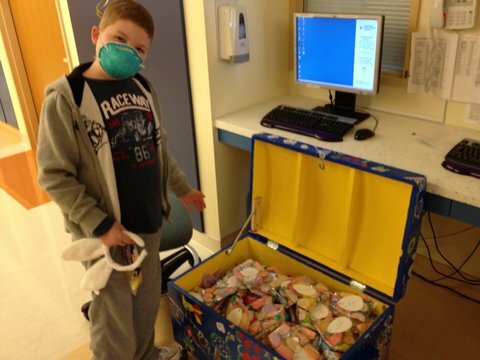 I also have used money I get from my Leukemia Slayer awareness bands to fill the oncology toy box now and then. I also have a You Tube page that I post videos about having cancer, some are funny and some are to make other cancer kids feel better about stuff like home chemo or port access. My school has a club called the LEO club that does community service projects like coat drives and food donations, I joined the club and plan to see if they would want to participate in some sort of toy drive for the hospital this year too. HR: If people want to help, what are some things they can do? J: If people want to help me with my Hoops 4 Hope fundraiser they can donate or sign up to be a team member and help me raise money! (if you want to join my team the password is “jacob”.) The event is at Stanford on October 21. My theme is “Alone we can do so little; together we can do so much” -Helen Keller. I believe every dollar counts and I would like to prove just how much of a difference many people can make by just each donating $1.00. Also, if you knit you could make hats or blankets and donate them to LPCH oncology floor. Someone made me a blanket and gave it to me when I was first diagnosed and it made me feel good to know someone cared. You could also donate toys or games to child life at LPCH. I have had to spend a lot of time in the hospital and child life has a “forever young zone” play area and they do fun activities like Bingo and crafts. It was always fun for me to go play Bingo and win a toy! Or you can spread awareness so other people know kids get cancer and we need more funding so doctors can find a cure. HR: I know you like quotes. Do you have a couple favorite quotes that keep you fighting? This entry was posted in Child Health Advocates in Action, Health and tagged Childhood Cancer Awareness Month, Hoops 4 Hope, leukemia, Lucille Packard Children's Hospital, The Leukemia Slayer by My Two Hats. Bookmark the permalink. I’m friends with Slayer on his fb page, but have never met him. Regardless, he makes me proud. He is so strong and insightful for his age. A true testement to bravery. Jacob is a great kid. He doesn’t feel sorry for himself, and he doesn’t think only of himself. He thinks of other kids – how to help fellow cancer patients – and raising money to fight cancer. He is a wonderful example. Go, Slayer, go! Wish the best for this kid. No child should have to go through what he is, but he truly is a superhero! And, thanks for asking what we can do to help. If nothing else, I can knit! Jacob is such a brave and wonderful soul! Wow what a journey on earth he has and how great he is doing with his challenges. He is an inspiration for all of us! Sending you big hugs dear. The MDS and Leukemia Warrior Facebook page! Holly and Annie Bachmann (Annie’s Dad, Lothar, lost his battle with AML on October 8th, 2007. We will be going to The Leukemia Slayer’s page and donating for his Hoops for Hope as a memorial for Lothar’s 5th anniversary of passing to heaven! Great job Jacob! Prayers for your continued success and progress.